Presumably sidetracked by the engineering feat of wedging a Radeon GPU into a processor, AMD has rolled up fashionably late to the stereoscopic 3D shindig. Unlike its arch graphics rival, however, AMD sees no need to manufacture its own shutter glasses, it openly mocks USB emitters and it curiously relies on third-party middleware for existing games. Why is AMD adopting such a radically different strategy from Nvidia, and is it really taking 3D gaming seriously? We're joined by AMD's software product manager for Eyefinity, video and HD3D, Shane Parfitt, to find out. Bit-Tech: So how does HD3D work in games? Shane Parfitt: For 3D gaming, we have what's known as the quad buffer in our driver, which was developed by our Direct3D engineering team and supports DirectX 9, 10 and 11. It's kind of like an API in our driver that allows either games or middleware to tap into our driver with two streams of data at once – one frame for the left eye, and one frame for the right. Right now a lot of what comes into the driver is dual-buffered – the dual buffer provides things like the vsync controller that you see in a lot of games. The quad buffer basically provides that times two, so it doubles up on the existing taps into the driver for games - one dual buffer for the left eye, and one for the right eye. We then have our middleware partners DDD and iZ3D, who support a long list of games that can be converted from regular 2D to stereo 3D. Right now, we're also offering a promotion for owners of AMD graphics cards, so if you go to DDD or iZ3D's ordering sites and you order this middleware, the site will detect if you have an AMD graphics card and apply a 50 per cent discount. We're going to be running that promotion for quite some time. SP: Yes, we're absolutely working with developers too. We're expecting to see native stereo 3D games later in 2011. 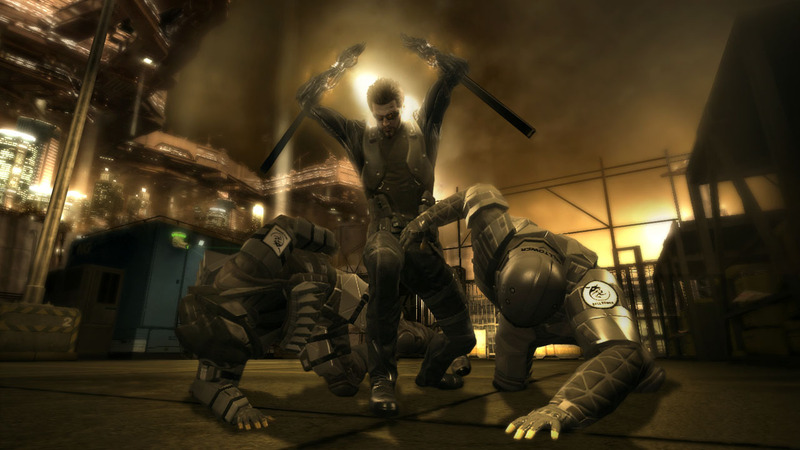 In fact, Eidos, the developer of Deus Ex: Human Revolution, has announced that it will support native stereo 3D in the game, including our HD3D technology. That means Eidos will render images for the left eye and the right eye in the game, and tap into our quad buffer driver directly without the need for middleware. We're working very closely with Eidos right now on Deus Ex: Human Revolution, and we have a whole team of what we call ISV alliance managers who work directly with game developers. There will be a few native 3D games coming out this year, but we expect middleware to be very important too – not all developers are going to support native stereo 3D, as it adds a lot of complexity. BT: What's the open stereo 3D initiative, and how does it differ from Nvidia's strategy with 3D Vision? SP: It's really exactly that - an open approach to enabling stereo 3D – we want all the technologies to interoperate with each other through an industry standard. If you look at the consumer electronics industry now, its ecosystem is based on industry standards like HDMI 1.4a. If you buy a Blu-Ray 3D player from Samsung, for example, and you buy a 3DTV from Sony, you can expect them to work together properly in stereo 3D. That's what we're trying to accomplish on the PC side; we want products from multiple manufacturers that can interoperate with each other through industry standards. We're working with a number of partners to work towards that goal, and there are a few things that need to come together. As well as our middleware partners for stereo 3D gaming, we're also working with major ISVs like Roxio to enable Blu-Ray 3D playback, and we're working with glasses manufacturers too. Our approach also gives display manufacturers more opportunities to differentiate and experiment with different panel technologies for shadowing, polarisation and all that kind of stuff. BT: Something can only really be called a standard if everyone uses it, though. What's your definition of an industry standard in this case? By industry standard we mean that it's defined by a standards body. There's a standards body that drives the HDMI 1.4a specification, and DisplayPort has these protocols that are well documented and defined in the DisplayPort standard too. We also support HDMI 1.4a in the 5000 series through software, but the 6000 series actually has hardware support for HDMI 1.4a. The competition does in fact support HDMI 1.4a, but we're also supporting 3D over DisplayPort, which is defined by EISA, and I don't think our competitor is supporting that at the moment. Samsung has already announced some monitors that will support stereo 3D over DisplayPort - the SA750 and the SA950 - so we'll put out a driver update that supports those monitors.